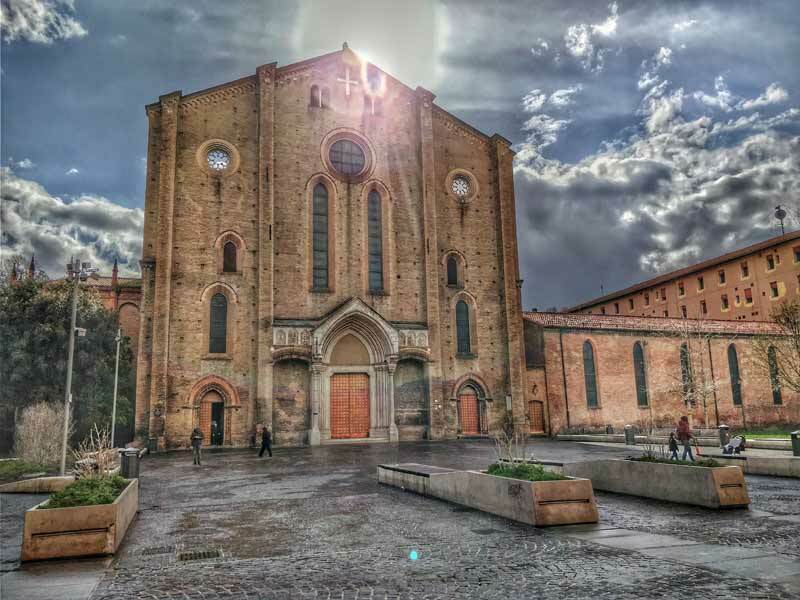 The Basilica of San Francesco is one of the most important churches in Bologna, the fascinating Gothic-Romanesque architecture will leave you breathless. The majestic and twisted structure of this Gothic style church will dazzle you as soon as you see it. Its construction dates back to 1263 and is perhaps the first example of French influence in Italian Gothic style. The Romanesque sign is instead present on the façade that from Piazza San Francesco. In general, the basilica has something mysterious and the glances of passersby are forced to stop and contemplate it. The interior may seem more austere but conceals remarkable treasures such as the beautiful marble altarpiece and the tomb of Pope Alexander V.
Visiting this sacred place is definitely a diversion that will make your Bologna trip special. The building was created by the Franciscan Bolognese community with the help of Bernardo di Quintavalle. The high altar was consecrated as early as 1251 by Pope Innocent IV, although the church was not completed until 1263. For almost a hundred years this beautiful place of worship was stripped of its function and desecrated. In fact in 1796 the Napoleonic troops looted the basilica and then turned this masterpiece into a barracks and then a warehouse. The Tombs of the Glossators are the fascinating funeral arks that stand outside the church, these conserving the remains of the major professors of the ancient University of Bologna: Odofredo Denari, Francesco D’accursio, Rolandino Dei Romanzi. This type of architecture is typical of the Bolognese medieval school and the particular form of these monuments attracts the gaze of passers-by who catch a glimpse of the church crossing Piazza Malpighi.